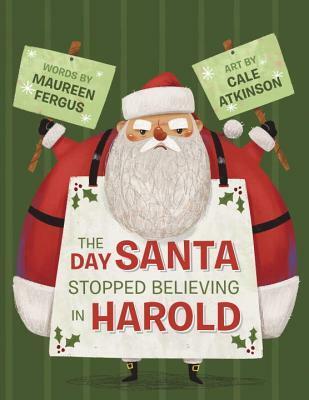 The Day Santa Stopped Believing in Harold, written by Maureen Fergus and illustrated Cale Atkinson, is a delightful addition to Christmas picture book collections. This book, which will be released on October 11th, sort of flips the script on the whole belief-in-Santa issue. In this story, Santa has doubts about the existence of a boy named Harold. Santa is distraught that Harold’s letter was probably written by his parents (who likely want all those gifts for themselves), and he’s sure that a little boy couldn’t possibly lift the big container of milk left out for Santa. On top of that, Harold just didn’t look the same when he sat on Santa’s lap last year. It all adds up, but what Santa really needs is proof one way or the other. As for Harold, he has his own doubts about Santa. He hatches a plan to catch Santa in the act of delivering presents. What Harold doesn’t know is that Santa has his own plan to see if Harold is real. What happens next is both hilarious and heart-warming, and it will restore both Harold’s and Santa’s Christmas spirit once more. The Day Santa Stopped Believing in Harold is a great book for Christmas storytimes, no matter the age of the reader. Young readers who believe in Santa will appreciate seeing Santa’s side of things. Older readers will enjoy the humor present throughout the book, and this charming story may just inspire them to once again experience that childlike belief in Santa and the magic of Christmas. Aside from the story itself, I think it’s also awesome to see depictions of biracial families in children’s fiction. It’s not a big deal in this book–and it shouldn’t be–but the mere presence of this family in the story makes it a necessary addition to many school and public library collections. Miles Murphy has just moved to boring Yawnee Valley–where cows outnumber people–and he’s not happy about it. 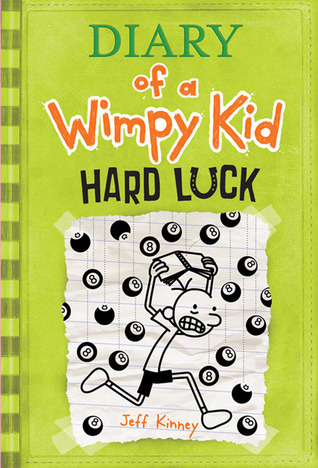 He’s left his school, friends, home, and reputation as a top-notch prankster behind, and he has to start over in a town where he doesn’t know anyone. To make everything worse, it seems this town already has a prankster, and, loathe as he is to admit it, this prankster may be even better than Miles. How can Miles possibly make himself known as the best prankster with this other guy running around? Miles tries his best to pull the ultimate prank and get a leg up on the other guy, but he’s always foiled at the last minute. Can it be that Miles is not the prankster he always thought he was? Nah…that can’t be it. Finally, Miles has enough of his ill-advised prank war, and he decides to join forces with his former nemesis to form the Terrible Two, surely destined to be the greatest pranking duo of all time. This twosome devises the most epic prank ever seen in Yawnee Valley, a prank that people will talk about for years. A prank that may have the power to take their enemies down a notch or two. A prank that, if all goes according to plan, will cement their status in the International Order of Disorder. Can Miles and his new partner-in-crime pull off this most awesome of pranks? 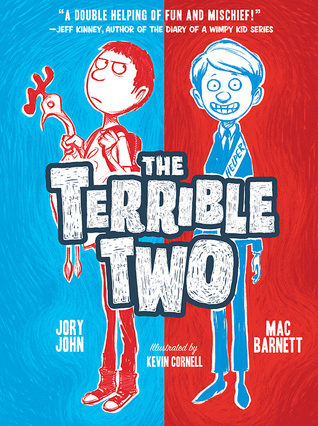 Find out when you read The Terrible Two, written by Jory John and Mac Barnett and illustrated by Kevin Cornell! 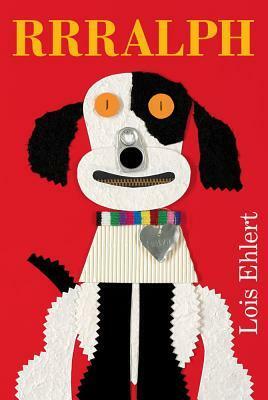 Rrralph by Lois Ehlert was a nominee for the 2013-2014 South Carolina Picture Book Award. Rrralph is a very easy-to-read book about a dog who seems to be able to talk. He even told his owners that his name was Ralph! Ralph tells his owners when he’s on the roof, that there’s bark on the tree, that the path is rough, that a wolf is nearby, that he wants to come in the house when he’s scared, and he makes it clear when it’s time to sleep. Can Ralph really talk to his owners? 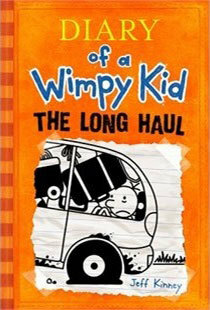 The fun will be in having young readers decide! Like many books by Lois Ehlert, the best part of this book, in my opinion, is the illustrations. These collages were made from zippers, wood, buttons, twine, metal, tree bark, screws, hand-painted and handmade papers, and textile fragments. Readers will enjoy seeing how these objects come together to make lively pictures, and they may even be inspired to use everyday materials to create their own pictures. Rrralph is an excellent book to share with art teachers and students who are interested in visual arts. This book may also generate discussion on different ways we can use or recycle materials. Who knew that being out of milk would lead to such craziness? Well, that’s exactly what happened one morning in a perfectly normal household. The father went out to get the milk, but he had quite the story for his disbelieving children when he returned. After getting the milk that his kids needed for cereal–and he wanted for his tea–it seems that Dear Old Dad got a bit sidetracked by a few things. Things like spaceships, green globby aliens, pirates, piranhas, a professorial stegosaurus with a time-traveling Floaty-Ball-Person-Carrier (hot air balloon), an ancient volcano god, ponies, wumpires, the space-time continuum, the galactic police, and dancing dwarves. Is the father’s story true? Could he have possibly gone on a time-traveling adventure with the strange Professor Steg? And how did he ever get the much-needed milk home to his children? Read Fortunately, the Milk to find out! 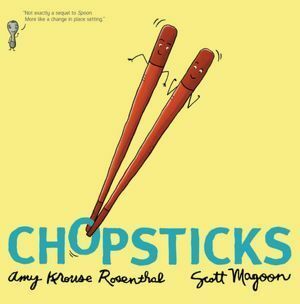 Chopsticks, written by Amy Krouse Rosenthal and illustrated by Scott Magoon, is nominated for the 13-14 South Carolina Picture Book Award. 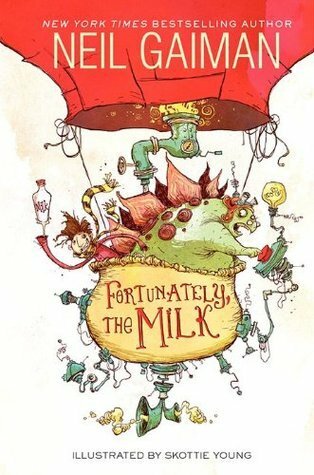 This story is filled with little details that will cause older readers to chuckle and younger readers to wonder what is going on. I do think the message of Chopsticks is a good one: While it is important to stick together, we become stronger when we learn to stand on our own.